I am planning to take my daughter to the salon for a haircut. It's unbelievable how fast her hair grows! I cut her bangs myself from time to time but now she obviously needs a proper trim. She does not want her hair too short so I was looking online for kids' haircuts and girls' haircuts that would be suitable for her taste and the cold December weather. One exciting thing about little girls is that there is so much you can do with their hair. Browse my own compilation of little girls' haircuts and you just might find something that perfectly fits the personality of your precious little princess. My daughter's hair is straight but a little wavy – something she takes after me, actually. The length has gone a little beyond the shoulders and the original layers from her last haircut are no longer defined. Her bangs are now almost to her eyes. 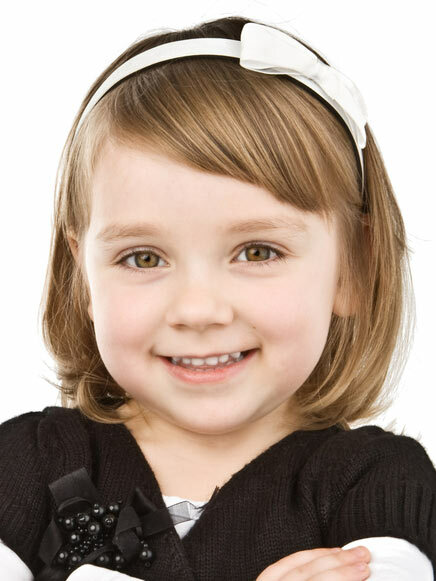 I want something comfortable and fresh looking so I looked for little girls haircuts that keeps away the hair from the face, are easy to put in a ponytail should it get too hot, and which would look great when worn with headbands and hair accessories. This girls' haircut is short and refreshing to look at. Done by Carol Bruguera, it is exactly the kind of cut that both little girls and their mothers would like. It carries just the right touch of stylishness without sacrificing the child's comfort. Maybe I will ask the stylist to copy it! This is more similar to my daughter's usual cut. Simple layered tresses with the traditional straight bangs. It looks clean, simple, and very playful. We may also have it cut a little longer. These are so cute! Will definitely find a good one for my girl!